DayBack employs some of the views you'll find in a traditional calendar along with a few new ones. 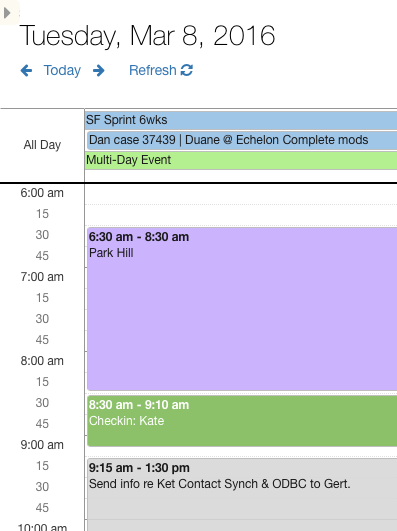 Of the traditional views, Day and Week view have both "schedule" and a "list" option. 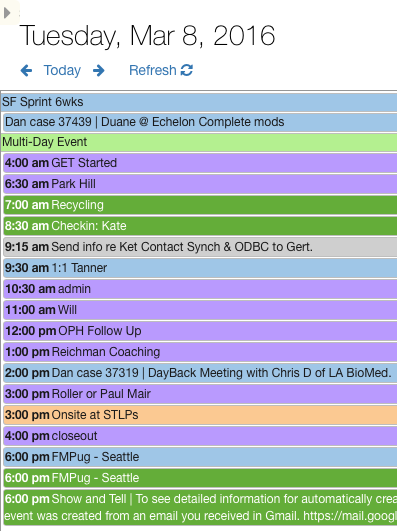 Schedule and list view show the same records but schedule views will place items in a grid of times for the day or week. You can change the schedule view's scale from the default 15 minutes in the Settings tab of the sidebar under Time Settings / Time Scale. The month view in DayBack is a traditional 42 cell grid but there are a few view options that make it more useful than the month view in most calendars. All of these options can be found in the Settings tab of the left-hand sidebar under "view settings". 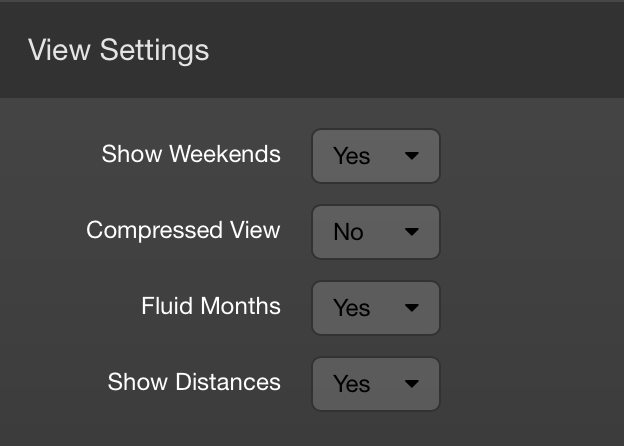 And most of these settings work on other views (like Day, Week, and Schedule) as well. Compressed View: by default DayBack expands each event to show as much text as is in the combined title and description. With Compressed View "on" each item in the calendar will be rendered as just one line so you can see more events at once. Fluid Months: by default DayBack will enlarge the height of each day in the month to show all the items for that day. This almost always means you'll need to scroll down to see more of the month, but you know that you're always seeing all the events in each day. With Fluid Months "off" DayBack will fit the whole month on your screen and show "x more" when there are more events for a day that can be shown in the space allotted. Note that the horizon view respects the same filters as the rest of DayBack and so when it's filtered to show a single resource it can depict a nice gantt-like view of the resource's upcoming work. The resource views let you make sense of dense schedules by creating one column for each resource (or one row for each resource on the grid version). This lets you see what each resource is doing and scan for gaps where you can accommodate new work. Scanning for gaps in this way is especially useful when you're looking at more than one day at a time: the resources menu lets you view up to 14 days at a time. 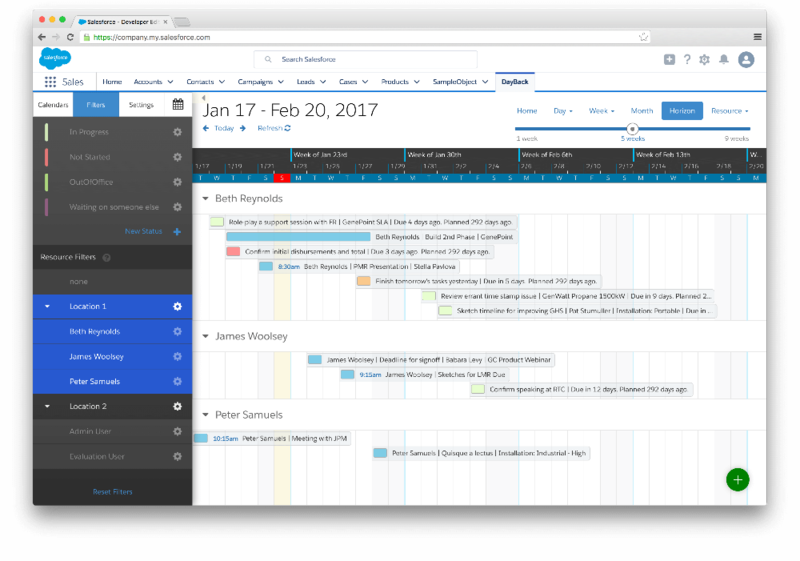 Resource scheduling gets a more detailed treatment here: resource scheduling overview.